Please don’t tell me not to worry … have you seen an Arizona bark scorpion – or any scorpion for that matter? Um, no. We can’t brag enough about our Valley, how gorgeous our mountains are or how perfect our unfailing Arizona sunsets make a summer evening, but we can absolutely deal with scorpions. Scorpion control is extremely important, and in fact, can be a matter of life or death. For some this fear may not be as readily terrifying, but just because you can’t see them doesn’t mean they aren’t there. Scorpion home sealing is one of the best ways to avoid a run-in with scorpions and makes a huge difference in the Arizona heat. Scale of one to ten – what should my terror level be? Breathe. We’re here to answer all of your questions, not to mention keep your home safe from these unwanted pests. The Arizona Bark Scorpion is among the most dangerous scorpions in the world, thriving in the heat under the Arizona sun. These scorpions are known to have a venom level compared to that of the more common deadly snakes known to us. Too bad for all of us that love the desert we get to deal with an entire lot of creepy crawling things, from snakes to cockroaches to scorpions. They can range in size from two to three inches, and are the same color as the new cool-guy Toyota Tacomas – or “Desert Sand”. Built for camouflaging into their surroundings, most of the time they are incredibly hard to spot. Usually they will attempt to keep cooler in the shade during the summers, hiding under bushes and even cars. Basically don’t reach under your car if you don’t have to. Fun fact about these creatures? They glow under black light – but most definitely won’t add any fun to your next glow party. Considered an aggressive scorpion, and the most aggressive of the scorpions in North America, there is no reason someone should want to encounter such a “insect”. We prefer “monster” as a classification. As with any bite or sting it’s best to seek medical attention, especially with any serious pain associated with a sting from these Arizona Bark Scorpions. Many victims of the stings report feeling an electric-like pulse after being stung. Symptoms can range anywhere from dizziness, swelling at the sting site, foaming of the mouth or trouble breathing. How there’s so much power in something so small we may never understand. The most threat occurs for the elderly and younger children, as their metabolisms and ability to process the venom may not be as strong as the average adult. Some cases don’t even require hospitalization, although many would suggest that the anti-venom available in almost all hospitals in Arizona is the better option. Apply a cold compress to the area in which you were stung, this will help reduce the swelling and pain at the site. Taking a dose of acetaminophen can also help the swelling and pain. In extreme cases opiates are needed to dull the pain of a scorpion sting but it’s best to seek medical attention as quickly as you can, and to avoid the area in which you got stung so it doesn’t happen twice! It’s subjective depending on the pain level and symptoms whether calling 911 is the best option. Truly, it’s hard to tell how much venom is released upon a sting so varying degrees of cases make it hard to create a go-to answer. 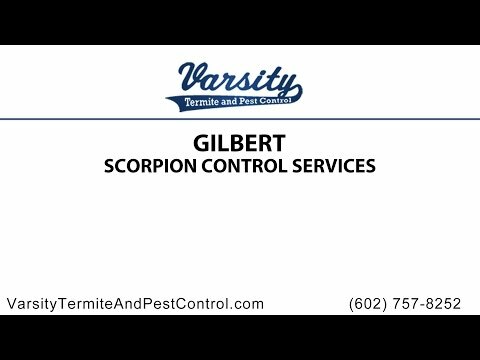 Varsity Termite and Pest Control has been dealing with scorpions in Arizona for years, specializing in Gilbert Scorpion control and scorpion home sealing. We are more than able to create a safe haven and protect you from the potential risk. Scorpion home sealing creates a barrier so that the scorpion cannot enter the home, thus negating the problem. Our Scorpion Barrier service seals the foundation of your home, attics, crawlspaces, and under doorframes. We do a complete dusting of attics, fences, electrical outlets and even plumbing points to prevent them from sneaking in anywhere. Varsity Termite and Pest Control won’t leave any stone left unturned (that’s the creepy part, right?) so our Mesa scorpion control includes sealing roof vents and air conditioning lines. Read the rest of Why is Phoenix Considered the Scorpion Sting Capital?